The Episcopal Church of the Incarnation welcomes all seekers wherever you are on your spiritual journey. We are a parish in the Diocese of California in the Episcopal Church, which, in turn, is a province of the worldwide Anglican Communion. We are also a covenanted member of Oasis California, and we commit ourselves to affirming lesbian, gay, bisexual, and transgender people and welcoming them into this Christian community. We live and share the Good News of Jesus Christ through worship, education, fellowship, pastoral care, and service to the world. In 2014, we celebrated our 100th year anniversary of being a parish in the Diocese of California. Come join us! 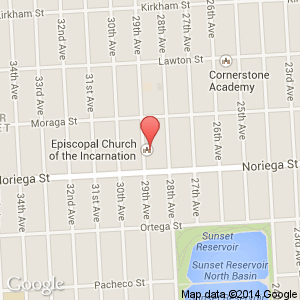 The church is located in San Francisco's Sunset district. Our facility is wheelchair accessible, and assistive listening devices are available upon request. For additional transportation information, click here. Friday April 26 7:30 p.m. San Francisco Girls Chorus Level III of the San Francisco Girls Chorus School and SFGC’s Soloist Intensive will perform a varied program of choral music, art songs, opera, and musical theater scenes. For more information click here. Saturday April 27 7:30 p.m. Cristobal Selamé in Concert Classical guitarist Cristobal Selamé will perform a varied program of works by Mertz, J. S. Bach, Mangore, Tárrega, Malats, B. Powell, Garoto, and Pernambuco. For more information click here. Sunday April 28 7:30 p.m. Passion and Lamentations San Francisco Renaissance Voices will perform music from the liturgies of Holy Week by such composers as Barahona, de Victoria, and Allegri. Tickets: $30 General, $25 Seniors/Students, $20 Children. For more information click here. Saturday May 4 7:30 p.m. Cuarteto Puentes in Concert This Bay Area quartet will perform a selection of classic tangos from the Golden Era, as well as compositions by Astor Piazzolla. For more information click here. Saturday May 11 7:30 p.m. Trio Terme in Concert Trio Terme was formed last summer at the Interharmony International Music Festival in Italy. The three performers, all with extensive solo and ensemble experience, were so delighted playing together, that they decided to continue to explore the rich clarinet, cello, piano repertoire. For more information click here. Saturday May 18 2:00 p.m. Spring Vocal Studio Recital This vocal concert features students of Corey Head and will include music from many styles—opera, art song, musical theater, jazz, and pop. Students of all levels will perform for friends, family, and the community. Admission is $10. For more information click here. Saturday May 18 7:30 p.m. Robyn Carmichael in Concert Please join acclaimed pianist Robyn Carmichael for "Peers, Friends, Rivals: Four Romantic Masters," a program featuring the works of four towering masters of the keyboard: Chopin, Schumann, Liszt, and Mendelssohn. For more information click here. All tickets (unless noted): $20 General, $15 Seniors/Students. For the full calendar listing of our concert series click here. 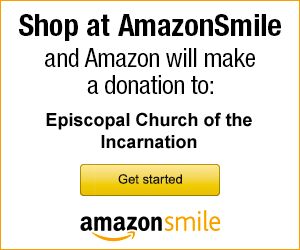 Please consider supporting Incarnation. Pay online via PayPal (click image below) or click here for additional options.